Like people, all dogs need exercise. And while certain small breeds can get enough of it just walking around the house, many dogs can develop health problems and behavior issues if deprived of enough activity. So if you own a Border Collie, Brittany Spaniel, Irish Setter or any one of the dozens of breeds that need a high amount of exercise, you know your pet is at his best getting miles of walking or running every day. For dog owners intent on keeping themselves and their dogs healthy, we’ve found several products worth checking out. If you have two pooches to take on your daily walk or run, you need two hands and two leashes, not to mention a bit of patience if they get tangled up. What’s different about the Tangle-Free Double Leash ($49.95) is that the two 10-foot nylon cords are fed through separate openings in a housing that twists as the dogs change position. That leaves you with one hand free to carry water for all three of you, or a cell phone if you’re into triple-tasking. Both these products let you bicycle with your dog by connecting your bike to your dog’s collar or harness with a stick-like device that keeps her from getting run over or tipping you over. While you’d think a creature hooked to a moving bike would result in disaster, it actually works pretty well, mostly because of shock absorbers that allow the dog to direct her own path and bob her head without pushing the bike around. These products aren’t for smaller dogs. For one thing, little ones usually don’t have the stamina to go long distances. Second, dogs that are more than 25 lbs. stand taller so they connect at a better level with the bike leashes. The WalkyDog ($39.95) comes out over the top of the dog's back, so pulling pressure is at the center of the neck. For that reason, some users prefer to use a harness with the WalkyDog, rather than a collar. The Bike Tow Leash ($146) comes off the bike at a lower point and pulls more from the side of the dog’s neck where muscles are stronger, so many bikers choose to outfit their dogs with collars. 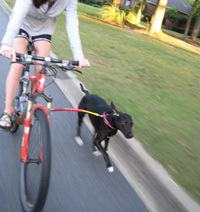 Why would someone want to spend so much more for the Bike Tow Leash? Apparently, a Florida engineer took six years to design it and now painstakingly makes each one by hand, whereas the WalkyDog is made overseas in bulk. 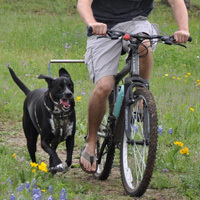 Scott Daughtry, owner of TheDogOutdoors.com and seller of both products, says the Bike Tow Leash is particularly good for large animals. “I have even biked a 170 lb Great Dane with this leash and felt in complete control,” he says, adding that dog owners should start out with short rides to build up their dog’s stamina and monitor paw pads, which can be worn down quickly. To guard against that, he suggests Musher’s Secret ($13.95), a wax that puts a barrier between your dog’s paws and the road. Let’s say you want to bike 10 miles but your dog can only go five, or not at all. Or maybe you’re looking for more of a workout than biking alone. You can always pull your pet, just like those kid carriers you see people towing behind their bikes. 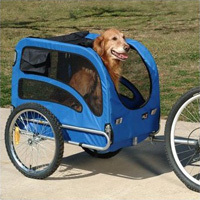 Solvit HoundAbout Bicycle Pet Trailer ($190), though, is designed especially for furry friends. It’s completely washable, has plenty of storage pockets to stash treats and water, and can pull up to 110 lbs—suitable for most dogs. We’ve all seen Hollywood stars toting their tiny canines in their manicured, diamond-clad hands. More down-to-earth dog lovers might try the Timbuk2 Muttmover backback ($90) for dogs smaller than 15 lbs. We like it because it has a clip that attaches to a dog’s harness, the sides are vented to keep things airy, and it just looks cool. 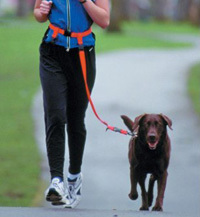 Serious runners like The Buddy System Hands Free Leash ($24) because it keeps the arms free for a more natural stride. Dogs can travel more naturally, as well, since the leash can slide completely around the wide belt attached to the runner. Speaking of that belt, it comes in different sizes to accommodate various girths and features a quick-release mechanism in case you want to un-hook from your pet in a flash. Owners of very strong dogs will appreciate the fact that their mid-section can take a strong pull better than a few fingers wrapped around a cord. How many times have you set off on a walk with your dog having forgotten a bag to pick up (eh hem) droppings? No more. Just clip the Bags on Board Bone Dispenser ($3.50) to your leash and you’ll never be standing by sheepishly while your dog does her business and a neighbor watches disapprovingly as you walk away empty-handed. Regardless of what product you use to exercise with your dog, remember to go during cool parts of the day, alternate terrain (don’t just exercise on pavement, especially hot pavement), and always bring water. With our border collie, we’ve used the Springer (http://www.springeramerica.com/) for years. It’s one of the best bike exerciser for dogs because it uses a spring to allow some sudden dog movements, a harness instead of a collar, and a safety release mechanism to prevent injury in case your dog goes on one side of a post or pole, and you go on the other. Thanks for sharing the tip, Bruce. The safety release mechanism sounds like a great feature.